234 pages | 14 B/W Illus. China’s rapid economic growth has drawn attention to the Chinese diasporic communities and the multiple networks that link Chinese individuals and organizations throughout the world. Ethnic Chinese have done very well economically, and the role of the Chinese Diaspora in China’s economic success has created a myth that their relations with China is natural and primordial, and that regardless of their base outside China and generation of migration, the Chinese Diaspora are inclined to participate enthusiastically in China’s social and economic agendas. This book seeks to dispel such a myth. 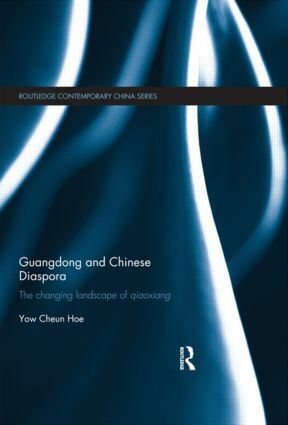 By focusing on Guangdong, the largest ancestral and native homeland, it argues that not all Chinese diasporic communities are the same in terms of mentality and orientation, and that their connections to the ancestral homeland vary from one community to another. Taking the two Cantonese-speaking localities of Panyu and Xinyi, Yow Cheun Hoe examines the hierarchy of power and politics of these two localities in terms of their diasporic kinsfolk in Singapore and Malaysia, in comparison with their counterparts in North America and Hong Kong. The book reveals that, particularly in China’s reform era since 1978, the arguably primordial sentiment and kinship are less than crucial in determining the content and magnitude of linkages between China and the overseas Chinese. Rather, it suggests that since 1978 business calculation and economic rationale are some of the key motivating factors in determining the destination and degree of diasporic engagement. Examining various forms of Chinese diasporic engagement with China, this book will appeal to students and scholars of Chinese Diaspora, Chinese culture and society, Southeast Asian culture and society and ethnicity. Yow Cheun Hoe is Assistant Professor at Nanyang Technological University, Singapore.